Our latest adventure with Lucy…arugula, white wine and we finally find out what kind of men she’s trying to swear off. 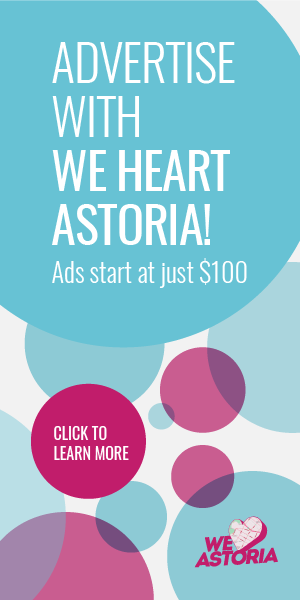 There is something very satisfying about spending a summer afternoon running errands around Astoria. For one thing there are always places to stop for a frappe or iced coffee. Plus I get to visit some of the best old-school mom and pop shops. Today was the framer on 30th Avenue and the vacuum repair shop on Broadway where – of course – he also rewires lamps. Thinking about these places that have been open for years inspired me to skip the newest spots and stop for lunch at a place that had been open for a while but I hadn’t visited in at least a year – Il Bambino. The decor is cute and the backyard patio is perfect on a sunny afternoon because they have a canopy that provides shade. All the tables outside were full and half were folks like me – pleasantly eating alone. Curious about the guy reading poetry and drinking a beer…. But wait, didn’t I swear off the brooding creative types? Its seems to me that the menu is possibly exactly the same since it opened. 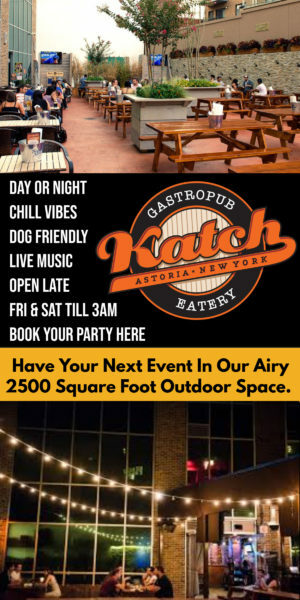 Tapas – meat and cheese plates, salads, panini and crostini. Wine and beer. 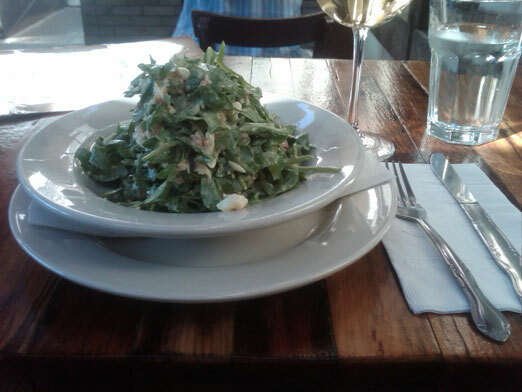 I had a glass of whatever white they were featuring – a delicious pinot grigio that was a little fuller than you might expect – and the baby arugula “mimosa” and salad with shaved egg and smoked bacon vinaigrette. It was delicious – if a little over-dressed. 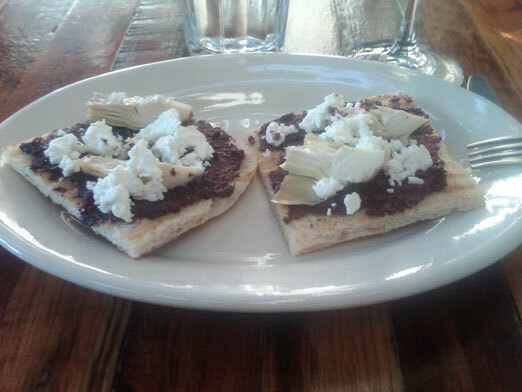 I also order the artichoke, goat cheese and olive spread. Perfect. The black olive tapenade is so good that when I drop a bit on my ankle I eat it – one of the many perks of eating alone. Love this post so much! Actually, the food you have mentioned here looks new and yummy.. 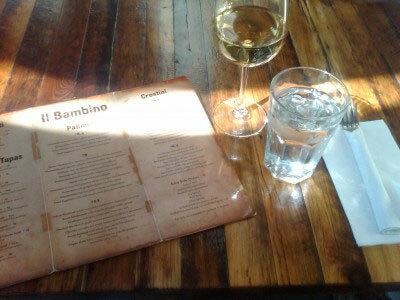 I think I have to check it out then..
Love these reviews, and very happy to see you picked Il Bambino. The place happily remains a favorite which is a bit of a surprise to me. A very nice choice whether to eat alone or with others. Thanks. Looking forward to more future Lucy posts.